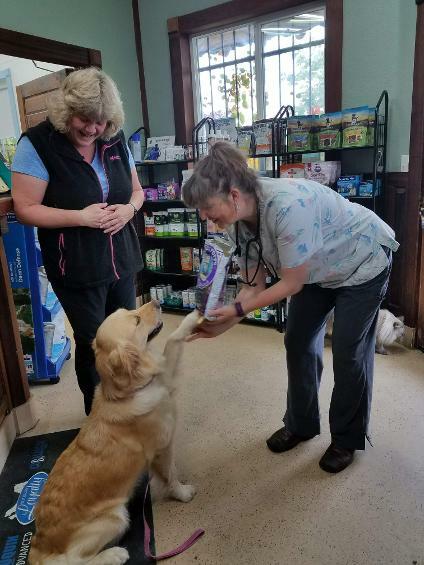 The most important thing you can do to make your pets' visit to the vet as pleasant as possible is to bring them in HUNGRY! Please withhold one or even two meals prior to the appointment. 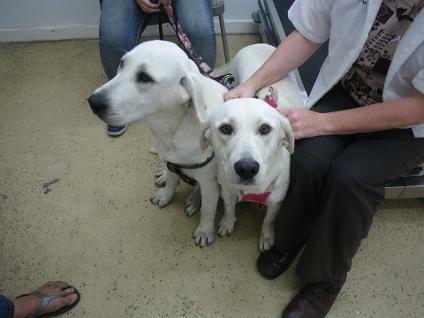 We will provide lots of treats which will help them have happy memories of their visit. This recommendation applies to both cats and dogs. If your pet is picky, bring lots of his/her favorite treats with you. For cats that don't like treats, their favorite food, dry or canned, often helps. You are even welcome to bring in a full meal, if that is what will make your pet happy! Here is a wonderful example on why to bring your pet in hungry. They will be jumping with excitement once the treats come out! Taz can be a little shy when she first comes to visit us. However, she can't resist our special treats for long! Before the end of the appointment we had her eating out of our hands, literally! 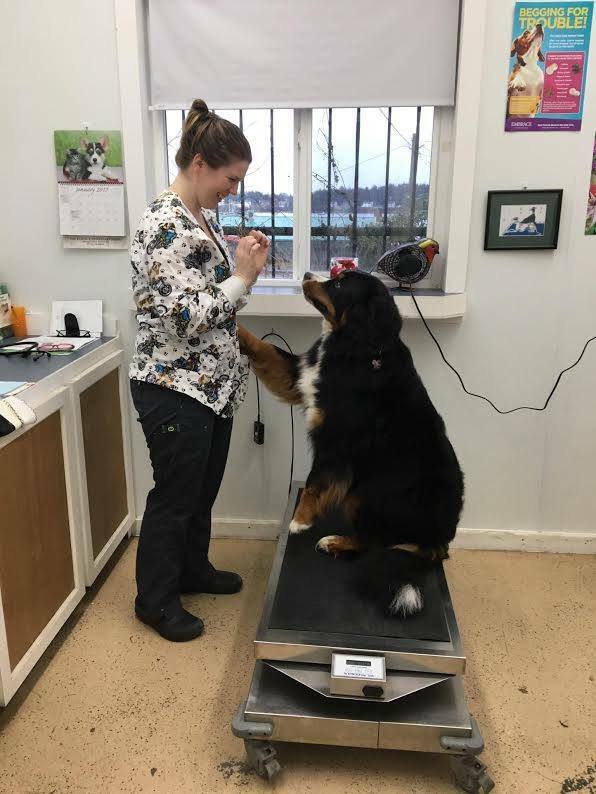 If your pet isn't very food motivated you can bring his favorite buddy to the appointment. This little bulldog had his best friend hang out with him while he got his chemo treatment. 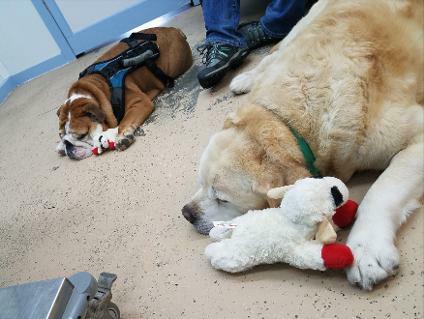 They would play for twenty minutes before the procedure and by the time we were ready they were both very relaxed to the point they had to take a nap! Here we have Denali who comes in for "happy visits" which consists of just coming in to say hello to our staff. They even get some special treats when they stop by! 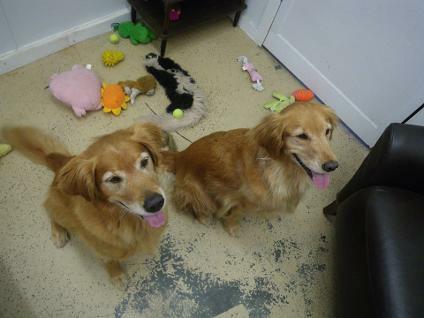 If you would like to stop by for a quick happy visit come any time around 11 am to noon. This beautiful lady is Charlie! She used to refuse to come into the clinic so we had to do our annual exams in her owner's vehicle. Her owner would bring her in for many happy visits and they sure did pay off! 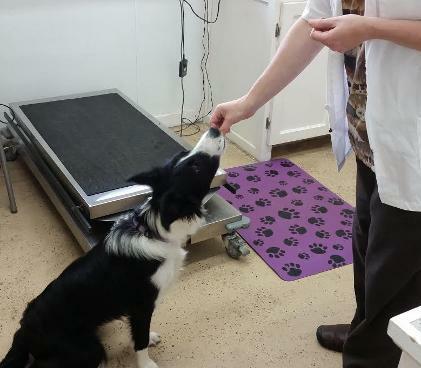 Now when she comes in she goes straight to our exam table and waits patiently for her treats, she will even do some tricks.